Tin Can Cabin is basically a collection of ideas, plans, and techniques that I am developing while building my shipping container cabin in northern Wisconsin. I’m a computer programmer in my day job, but enjoy design, construction, and being in the country in my free time. When I started this project there were enough sites showing and discussing container cabins, but very little detailed information on how to do it. I am trying to document this project in as much detail as possible to help others who are considering this type of construction. Hi Steve- thank you for your detailed postings and pictures. I agree there is alot of information and pretty renderings on container home technology but not enough detailed “How-to” info. I enjoy your postings and look forward to further posts. I am interested in shipping containers as a way to design and build affordable housing and was wondering about costs associated with your building project. I plan to write a final post detailing the costs when everything’s complete, but for now it’s looks like it will be about $80/sq ft totally finished. This will even include the cost of most of the furnishings shown in my Initial Design article. Now there are a lot of areas I could have saved money on. Purchasing new instead of used containers cost me an extra 3-4K. My foundation was definitely overkill, mainly for appearance sake, and I could have saved at least 3K there if I had used piers and done it myself. I have also had to hire a few things out that I just did not have time to do myself that would have saved me about 3K. All told, if I was really scrimping, I could have saved at least 10K and lowered my cost to ~ $60/sq ft. Please keep in mind that these costs are for a cabin and not a house. My heating system is a wood stove, there is no air conditioning, indoor plumbing will be VERY limited, and I doubt it would meet code for a permanent residence. Costs for a real shipping container home would be much higher. just reading over this, and was wondering about the piers that you did use, how much concrete was used to support those, (the pit in the photo looks large) what’s the approximate depth into the ground, if they had any steel reinforcing inside them, what are the cardboard tubes called and what was their size. Pondering an off grid ISBU home of my own in perhaps a few years time, up here in Canada. Thanks for the practical down low on ISBU buildings in North America. It took some sifting through a large amount of post modern design firm junk to find your refreshing corner of the internet. Can’t wait to see the finished product! Steve, I’ve been looking for a site that details how to do this for years. I saw it on AR15.com and had to tell you thanks for the detailed descriptions and great pictures. I have just skimmed your site but I am going to look at everything and see if this is viable for me to do out in the desert of NV where my kid and I have some land. I just found your site and like most of the poeple, it’s the first one that has a serious approach to this type of building technique. I am an Industrial Designer from Medellín Colombia. My dad business is about repairing semitrailers and truck tanks. My idea is to build some of this cabins for people wanting an affordable place to stay in the countryside using some of my knowledge, our tools and know how in manipulating steel and alluminum, and try to get enough money to build my own cabin some day. Hopefully have my own blog or website. I am doing some research as I want it to be a cheap, good looking yet a safe place for satying and living. I was concerned about the toxicity of the floor and I am happy I have found good details here. Can’t wait for the price details although the might be a bit different here. Thanks for sharing your experience and please keep posting. If you’re an industrial designer and your dad repairs semitrailers, you are in a much better position than I am to tackle something like this. In regards to cost, you should be able to build something for much less than I can – mainly because of your climate. While my foundation is close to 14% of my total, yours can probably be some simple concrete pads on the ground. My roof needs to support a 60 psf snow load, while yours just needs to shed some rain and provide shade. My spray foam insulation was 8% of my total, while I’m not sure you will even need insulation. A wood stove, chimney, insulated windows, drywall to cover the insulation – so many of my costs are just for dealing with the cold climate up here. I just ran some rough numbers, and if I was building in your climate and doing EVERYTHING myself, I would probably be around $30/square foot. That’s about half of what it would cost me here. Keep in touch and let me know when you start building. This is a great site. My husband and I are considering building a container cabin in upstate NY- thanks for the inspiration and insight. Just wanted to say that I’ve been looking around here for a couple hours, and I’m really impressed with what you’ve done here. As other have said, and you’ve found yourself, finding anything actually useful about building something like this is hard to come across. Mostly just images of super fancy houses done with the containers. I’m planning on working on something very much like what you’ve done here, and this is a great resource. I’m not very good with the program you’ve used to plan everything out, I’ve only sort of looked at it, though. We’ll see if I get better with it. If not, my brother is good at these things, fortunately. I am very impressed. So glad I stumbled upon your site. This is by far the best and most generous amount of info on this subject that I could find. I really like your idea of keeping the doors for security for when you are not around. Awesome job, and thanks for taking the time to share your experience. I have read your site from start to finish, and I can say no more than everyone else! What a great job you have done in the physical work as well as the documenting of it, you should be proud! Now go and enjoy your cabin!! Thanks Carl. I actually got a chance to enjoy the cabin this weekend for some Grouse hunting with my son. I only did about three hours of work which felt like a vacation. This is one of the coolest, most well conceived ideas I’ve seen for these container cabins. I am very impressed. I’ve been wanting to do this very thing only using 2 containers. I salute you and your amazing skills. This gives me much inspiration. I’m going to chime in with everyone else, thank you for detailing your build for us all. The site makes for an informative read, and your thought process is really what makes this all stand out. For some of us it’s not about throwing money at something like a water well or solar/wind power. It’s about living within our means. I have an architecture background, but have morphed professionally into Construction Management. I did my architecture thesis on the modular/shipping container family compound concept… lots of beautiful Sketch Up images, but not a whole lot of construction details. As my tectonic knowledge has grown, I have been struggling to find info beyond schematic designs. This site is well written, linear, and incredibly helpful from a planning/cost/lessons learned perspective. I’m about a year away from getting the ball rolling on a project in this vein (minus the outhouse and urinal for this gal) and couldn’t be more pleased to have stumbled upon your site. Keep up the good work. You’ve got a real fan. Thanks Sarah, I’m glad I could help. Please let me know when you start you project. Hi Steve – Great site. 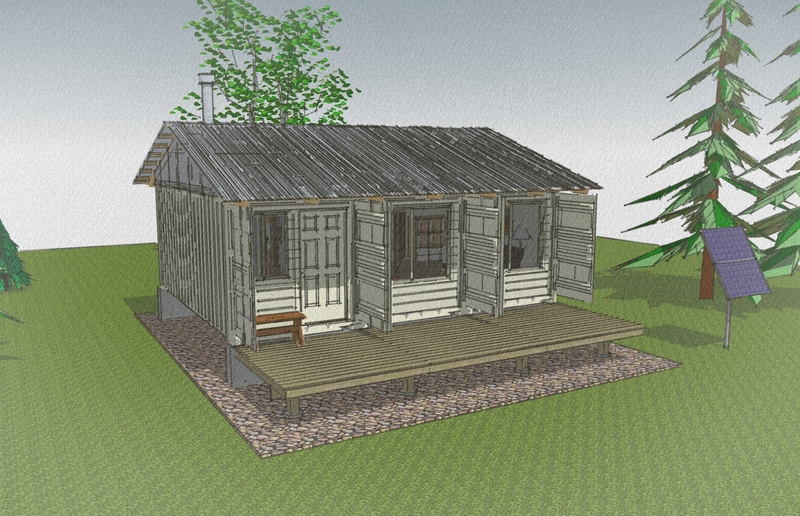 We will be building a home out of containers soon, and spend a lot of time at your site! Any overall info you can share that fits under the “if I would have known I would have…” catagory? Thanks so much! Hi Steve — amazing work on this. Out of curiosity, how would the price decrease (if at all), if using 40 foot high cube containers? I guess my question is whether there would be a linear increase in the price when increasing square footage or whether many of the costs are “fixed” in a sense and would not scale up exponentially with a larger design. Keep up the good work! I would expect some cost savings when using 40 foot containers since they typically cost less per square foot than 20 foot containers. On the other hand, high cube containers will cost a little more to finish out. For example, a 54″x12′ drywall panel costs $18.42 while a 48″x12′ drywall panel costs $9.38. There are ways around using the more expensive 54″ panels, but that usually entails more work. Also consider that a larger cabin generally costs less per square foot to build. Many core elements of a cabin, such as heating, electrical, plumbing, kitchen, and bathroom, typically do not increase in cost along with the cabin size. I have often wondered about the process of container fit out for residential use (long- or short-term). I completely stumbled across your site through Pinterest and am so glad I did! I can only imagine the time you have dedicated to sharing your experience. A very generous thing to do; thank you. The design tools you’ve recommended are much appreciated. Hope you’re able to enjoy your new cabin very often. Thanks for posting your project. I love looking at this site. I look at it often. I wish I had the land to do something like this. Very well done site in content and design. I am considering a container home and your information and observations have been extremely helpful. Please keep posting your ongoing experiences and “improvements”. Awesome job and website! May I ask a question? 1) How much less per-square-foot would you estimate doing this with 40ft units compared to 20ft? 2) Did you consider not having a 3rd unit in the middle? and bridging that gap with framing? What factors influenced why or why not ? 3) Why did you choose to elevate the structure on piers as compared with a gravel bed? Hi Steve Thank you for your in-depth blog. Being a single older woman (60’s) with no credit or chance of getting a loan I was so excited about building a home out of Shipping containers till I got to the end of your blog. I am glad I read what you said about the cost and the limitations. I was under the illusion that it would be quick easy and inexpensive. I did love the idea that I could put it on a flat bed and move it though. I can’t get into anything that will cost more than $30.000 or take forever. Could I ask you if you only had 30.000 to spend and wanted a 800 or 900 Sq. Ft. home what would you build it out of? Sips panels?? I want to be as off the grid as possible. I use very little electricity and passive solar would be incorporated. My biggest need is for quiet and as little in utility expenses as possible. Any suggestions?? Any direction wold be helpful. hi I am an engineer here in Brazil, and a lover of constructions, I was already 2 times the ride there in the USA and enjoyed, I was thinking of buying land (massachuster) and build a contenier home but do not know how and American legislation and and vialvel due to the cold, which steps I have to do to release the work in government organs. One of the best container cabins I’ve seen. One thing caught my attention though. I never thought of it before I built a cabin in the NC woods, but mice are out there and always looking for a home. I was wondering if they could get to the spray foam you put in the gaps between containers, or even into the roof system. They will squeeze through tiny gaps or chew there way in if they have to, but they never quit trying to find that safe warm place to set up housekeeping. Careful detailing is a must to keep them out. Hello, from Ontario Canada, I am interested in eventually building something similar to what you have built, completely off grid and secluded. How much was your final costs ? and who did you need to complete the work…. a welder etc. Thank you very much for a great website, lots of clear information.